RoyalSpace Village and Spa offer luxurious villas in which to relax and unwind .Each is tastefully decorated,has a fully equipped kitchen ,dining area,swimming pool,braai facilities ,WIFI and Dstv.RoyalSpace Village and Spa offers accommodation and spa services to different tpes of travellers for instance families,business travellers and individuals.Many guests like to stay at RoyalSpace Village because all guests are treated as royalty.Our unique village setup enables our guests to have a home away from home experience where they normally join the RoyalSpace team enjoying the African traditional dishes sitting by the boma fireplace. Aqua Villa is the most exclusive villa with two royal bedrooms with ensuite bathrooms. It has a fully equipped self-catering kitchen connected to a stunning dining pavilion with an integrated beautiful lounge fully furnished with comfortable couch, DSTV where people can relax. This villa has a fish tank with different types of fish which makes it unique .The location of the swimming pool for this villa allows our guests to enjoy viewing the gardens while swimming. Vio villa is located 5minutes drive from Midrand centre in Halfway gardens. It is in a secure and upmarket and royalty complex. Vio villa is a 6 sleeper suitable for families, groups and individuals the villa is consisted of a royal suite with a super king bed and lovely bathroom. 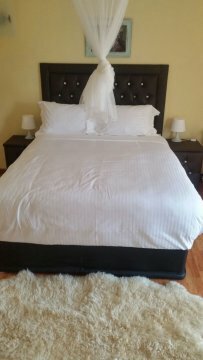 There are two standard bedrooms fully furnished with queen beds, and bathroom located on the upstairs .This Villa has WIFI, DSTV, braai, fully equipped self-catering kitchen, spacious lounge and eating room with view of the swimming pool deck and the garden.Vio villa is very convenient for business travellers since it is very close to the Midrand centre.